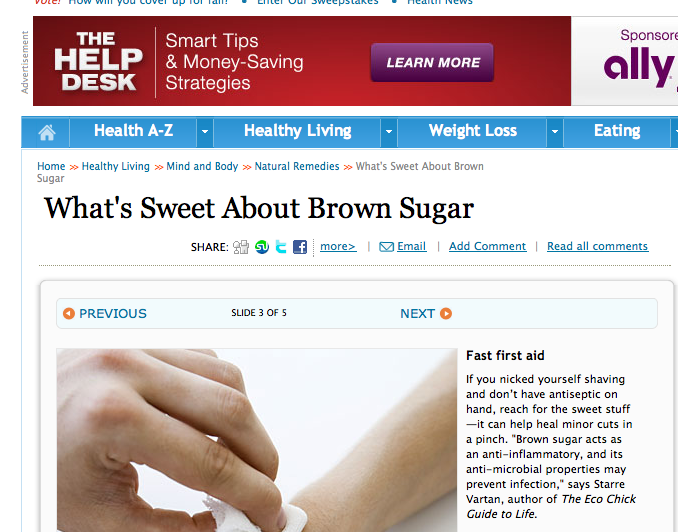 For a story on the natural benefits of brown sugar, I was quoted in the “Fast first aid” segment. Here’s the online link (page 3), but it was in the print magazine (September, 2011) too. If you nicked yourself shaving and don’t have antiseptic on hand, reach for the sweet stuff—it can help heal minor cuts in a pinch. “Brown sugar acts as an anti-inflammatory, and its anti-microbial properties may prevent infection,” says Starre Vartan, author of The Eco Chick Guide to Life. Clean the wound with soap and water, then pack a little brown sugar onto the cut (enough to thoroughly cover it). Put a Band-Aid over it and leave on for a few hours; repeat once once or twice over the course of 36 hours. You’ll be on the mend before you know it.